I wrote two poems that were very dear to me, but unfortunately never quite hit their mark with my critique buddies, neither the Poetic Musings nor my in-town group. Almost every poem I shared with my critique groups has been improved by the act of putting it out there, reading it aloud to my local group, and understanding how my marvelously eclectic poetic friends interpreted my words and my intentions. Each of these poems were different in structure and organization. They were about two friends of mine, very different people, who meant and still mean a great deal to me. I received guidance, comments, reworking suggestions, but no matter what I did, they never came to life. The richness and intensity of emotions, the imagery, and the story remained elusive. I’m going to give you some background, then share portions of one of these poems, what I was trying to get across when I wrote it. I’d like your input and ideas about how to make it closer to its heart. The first poem is titled “My Laurel Burch Bag“. It’s the story about how friendship grew out of an incident at a silent auction fundraiser for a shelter for battered women and children. 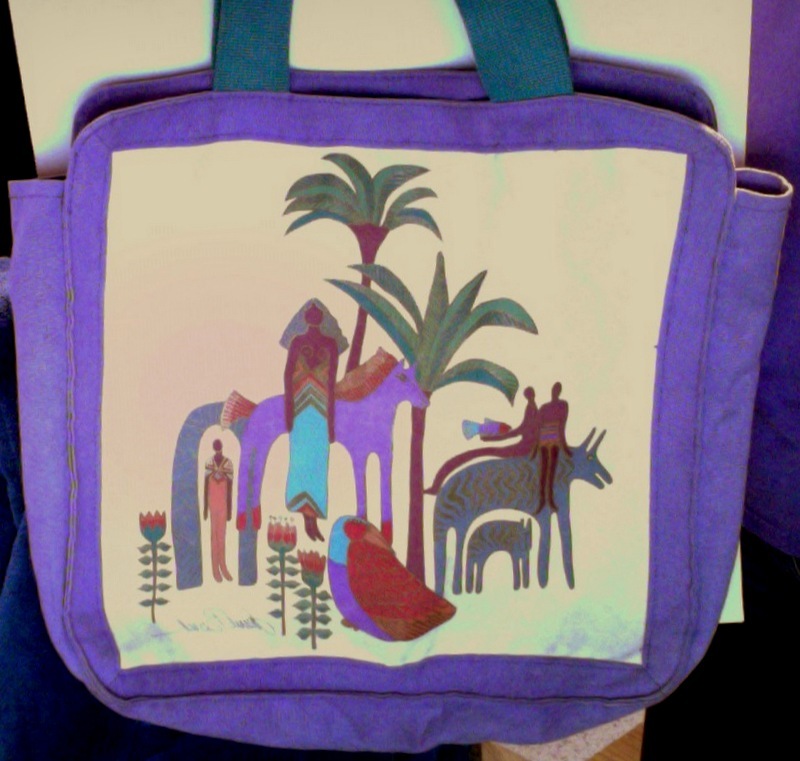 “J” and I bid against each other several times for this marvelous bag, which Laurel had donated to the cause. I won. Every time we saw each other, we joked about that Laurel Burch bag. That was in the early 1980s, and I still use it to carry anything that will fit. It’s traveled on trains, boats, airplanes, in cars and for 10 years in our motorhome as we traveled all around the US And Canada. Every time I load my goodies into the bag, I think of “J”. For couple of years, on my infrequent trips to the Bay Area, I met “J” for lunch. She was in the midst of caring for her sister, who was in late stages of breast cancer. I always made it a point to get together with “J” when I came to town. Our lunches often consisted of a lot of wine, mostly drunk by “J”, since I was driving; we had a couple of favorite locations where we were known and welcomed. Sometimes we talked about how awful and unfair the situation was, the pain of watching, the feelings of impotence at how little we could do to change anything. Other times we giggled our way through crazy assortments of appetizers and desserts, reminiscing about some of the wacky things we’d done together. I didn’t realize until several years later just how much my visits and off-the-wall sense of humor helped “J” cope with the reality she went back to face when we were done. I haven’t been back in almost 4 years, but I intend to contact “J” when we are there later this year. I know we’ll pick back up somewhere along that lengthening thread of friendship that doesn’t unravel even if we haven’t seen each other nor spoken much during this time. All of this I want to load into my Laurel Burch bag. Perhaps it is too much to try to carry in one poem, no matter how I pack it in, take it all out, reorganize, and repack it. But I keep trying. Now I would like your help to see if there is a way to make it all fit, to fill my Laurel Burch bag with these memories and love. Here are two working versions. each time I came to town. in my Laurel Burch bag. Brave post, Michele! I think I would start off the poem with the story of bidding on the bag for a good cause, how it began your friendship and how you still carry that bag to this day, then flesh out the details of caring for her sister and how that bound you together and cemented your friendship. I think all it will take is a little rearranging- you have good stuff in both versions. Michele, you’re getting there with the last two stanzas in version 2, where, IMO, you manage to connect – and convey to us — emotionally, what this means to you. Maybe concentrate on that, and not on the facts and history. Thank you for the ideas. The versions I used here were from early 2010, last time I took a shot at this. I’m moodling a very different approach, based on the kinds of forms you’ve shared on this blog, along with the suggestions to zen it down. ~as an Ekphrasis, climbing into the scene represented by the bag. Each of these will be a radical departure, and I’m excited to see where they lead!